In the past October, many new models emerged on the mobile market. How Antutu performance ranking results have changed with the emergence of these new models? 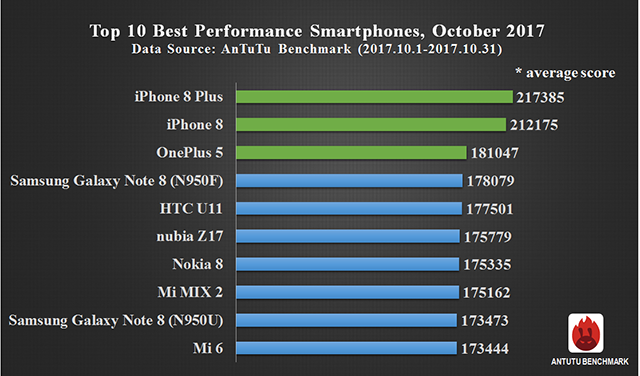 After gathering and combing data for 31 days, today Antutu reveals our benchmark results for the global 10 best performance smartphones of October. Come and check with us. 2.Period of data statistics: October 1, 2017 to October 31, 2017. 3.Data amount: at least 1000 data samples for a single model. 4.Data source: Antutu Benchmark V6. As usual, we have the overall performance ranking list as measured by the average Antutu score, which included both Android smartphones and iOS smartphones as well as separate lists based on different operating systems. First let’s have a look at the overall performance ranking list. 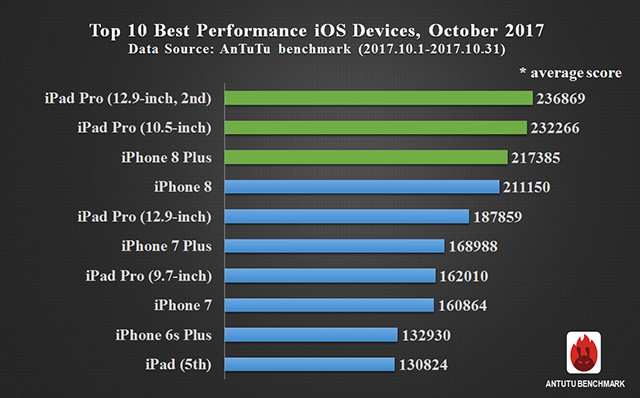 In October, iPhone 8 Plus continued to lead the overall ranking list for the second consecutive month with an average Antutu score of as high as 217,385, followed closely by iPhone 8 with an average Antutu score of 212175. 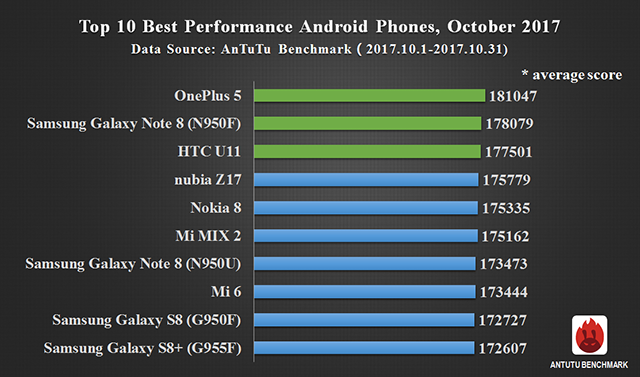 OnePlus 5 remained the third spot with an average Antutu score of over 180,000. Like iPhone 8 Plus and iPhone 8, iPhone X also features Apple's new A11 Bionic CPU, but as iPhone X has just started shipping on November 3, the number of iPhone X scores reported to Antutu database didn’t reach our statistical standard, therefore it is not present on the above list. With regard to the iOS list, the 12.9-inch iPad Pro entering the top 10, the 10.5-inch iPad Pro took a back seat, ranking at No.2. As two A10X powered iOS devices, both the 12.9-inch and 10.5-inch iPad Pro have an average Antutu score of over 230,000. iPhone 8 Plus only ranked third on the iOS list. For Android list, OnePlus 5 again topped the list with an average Antutu score of 181,047, followed by Samsung Galaxy Note 8 (N950F) and HTC U11 that gained average Antutu scores of 178,079 and 177,501 respectively. In particular, both the Exnynos 8895 powered Samsung Galaxy Note 8 (N950F) and Snapdragon 835 powered Samsung Galaxy Note 8 (N950U） ranked among the top 10 on the Android list with slight performance gap. In general, Apple A10X and A11X powered devices undoubtedly lead Antutu rankings with outstanding performance. Apple iPhone X and OnePlus 5T are expected to break into the top 10 in November ranking. The above data reflects the changes of smartphone performance for October 2017. For more information about the ranking list, please visit Antutu official website or download AnTuTu Benchmark and check in the menu of “Ranking”.